Sankassa (Sanskrit Sankasya) was a town on the western edge of the Middle Land. Legend says the Buddha descended from the Tavtimsa heaven at this place after spending three months teaching abhidhamma to his mother, who had been reborn their after her death. 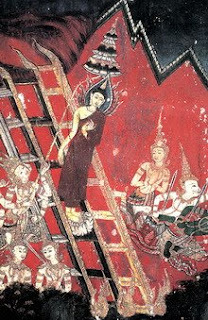 Supposedly three ladders appeared in the sky - a golden one on the right for the god Sakka, a silver one on the left for Brahma and a jeweled one in the middle for the Buddha. Some versions of the legend say that Brahma held an umbrella over the Buddha as he descended from heaven to earth. It is hardly surprising that the so-called miracle at Sankassa is not mentioned anywhere in the Tipitaka. The place itself is only referred twice in the scriptures and the Buddha only visited it once, passing through it while on his way to somewhere else (Vin.II,299; III,11). Apart from being incredible in itself, the Sankassa legend contradicts that Buddha’s prohibition against the public display of psychic powers or miraculous abilities (Vin.II,110-111). There is also no mention in the scriptures of the Buddha mysteriously disappearing from the scene for three months. The Sankassa legend’s association with the abhidhamma is a key to its origin and rational. The abhidhamma is conspicuous by its absence from the Buddha’s discourses. It is not mentioned as one of the nine branches of the Buddha’s teachings (navanga, A.II,103) and the account of the first council describes the recitation of the monastic rules, vinaya, and the discourses, suttas, but not of the abhidhamma (Vin.II,285). As the abhidhamma developed in the centuries after the Buddha’s passing and the books of the Abhidhamma Pitaka were gradually composed, pressure grew to have them considered canonical and included in the Tipitaka. When this happened, an explanation of their origin was needed and thus the legend of the Buddha going to heaven to teach the Abhidhamma Pitaka was created. Interestingly, this legend is not even mentioned in the Abhidhamma Pitaka itself but only in the much later commentaries. This suggests that it was considered just a ‘popular’ legend at the time the Abhidhamma Pitaka became canonical and only became ‘official’ later. King As oka raised a great stone pillar at Sankassa, parts of which can still be seen there. There is however, no evidence that this pillar was raised to commemorate the legend, which had probably not come into existence at that time. The earliest evidence of the Sankassa legend is a sculptural depiction of it from Sanchi which dates from about the 1st century BCE. The picture opposite is of me and Viraj in front of Asoka’s pillar capital at Sankissa. From what I've read there's little doubt among scholars that the Abhidhamma pitaka was composed much later that the other pitakas. Supposedly it was derived from the suttas, but what I wonder is how much of it is really derived from suttas and how much consists of things to fill the gaps? The Buddha, of course, was not bound by any rules for monks. The prohibition against the public display of psychic powers or miraculous abilities certainly did not apply to him (or to his Disciples when he permitted them to perform them, e.g. Ven. Moggallana's taming of Nandopananda). "At JREF, we offer a one-million-dollar prize to anyone who can show, under proper observing conditions, evidence of any paranormal, supernatural, or occult power or event. The JREF does not involve itself in the testing procedure, other than helping to design the protocol and approving the conditions under which a test will take place. All tests are designed with the participation and approval of the applicant. In most cases, the applicant will be asked to perform a relatively simple preliminary test of the claim, which if successful, will be followed by the formal test. Preliminary tests are usually conducted by associates of the JREF at the site where the applicant lives. Upon success in the preliminary testing process, the "applicant" becomes a "claimant." To date, no one has passed the preliminary tests." I think this says a lot about psychic powers from any quaters! He was not there just to teach the Abhiddhamma.